Like most Friday’s, a morning run is a must!! Before long, we called Nana and Papa to see what they were up to. We have a family event on Saturday, but we were not expecting them in town until tomorrow. A welcome surprise, they were coming tonight! After a little time had passed, we decided to meet up with them for another meal – yeah, little man is good at wanting to eat within an hour after eating a meal…I think part of it is being bored…but he still puts some major food away! We ate and just sat around talking. The hubs showed up when he got off work and added to the conversation 🙂 Before too long, it was getting late, little man’s bedtime was due, and the in-laws still had a little more driving to do. We would get to see them again tomorrow afternoon…so little man wasn’t too upset that they were leaving. Off to bed we go! My Saturday morning 16+ came too early… Since I run before the hubs has to be at work, the longer the distance, the earlier I need to get out the door! Once I was changed, I made my way upstairs – and this is what I saw 🙂 I wish you could hear the random blabber that he was saying him “reading” the book, but it was all too cute! I was then able to talk to the hubs for a minute before little man wanted out of his jail room. We got dressed and headed downstairs to start the morning 🙂 Coffee for me, breakfast for little man, movie on the TV, and relaxation began (for a little while!). 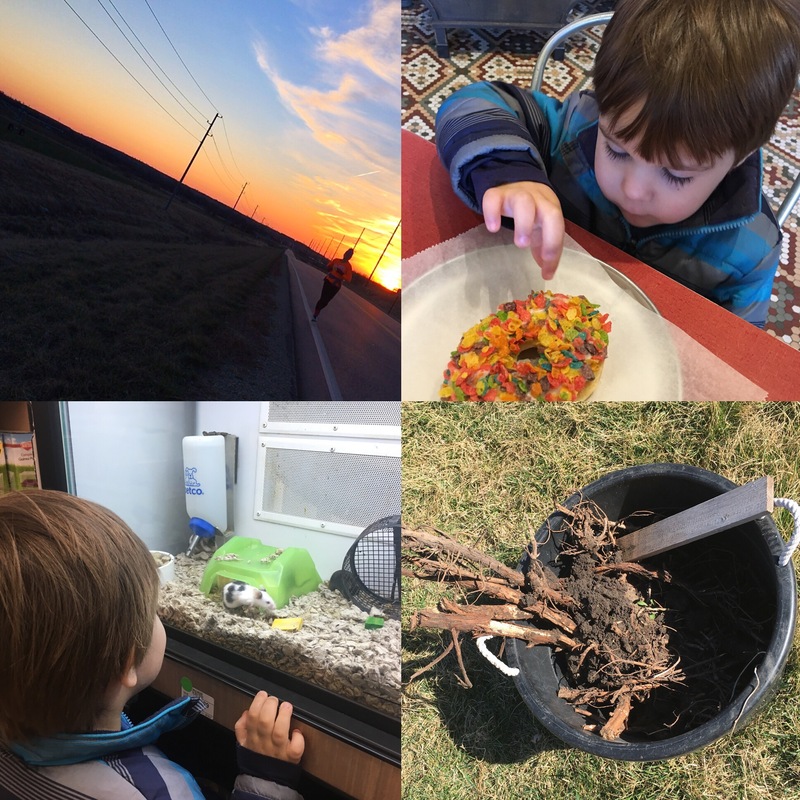 We went out to the Farmer’s Market to see what we could see – bought little man his usual cookies and refilled my kombucha bottle. There is always a lot to see and try at the market, but we don’t spend a lot of time talking to everyone. Once we left the market, we headed to the grocery store. I just needed to pick up a couple essentials and then we were going to head home. Since the hubs was busy and didn’t take a lunch, he asked us to bring something by – so we stopped by another store and grabbed him a sandwich, went through my bags from the first store and gave him some snacks, and dropped them off soon after. Little man didn’t get a long nap today, but around 1.5-2 hours was all we could sneak in. We had plans to drive to a near-by town to celebrate a couple of family birthdays! It is good to see everyone all hanging out – the food was great, the cake was yummy, and the kids had fun hanging out together 🙂 Oh course, little man was just happy that he got to play with Nana and Papa again. We headed home a couple hours later – just in time for some dinner and relaxing time at home. Since the hubs didn’t get to go to the party, he went by his cousins house to hang out that evening. Hubs out = early bedtime for me!! I started my Sunday with a morning Konza run! A few ladies from Lawrence came out to run the Konza – since the weather was iffy, the additional runners stayed back for a more local jaunt. We had a good time though! When I got home, little man was in his room…almost naked! I guess he decided to start trying to dress himself since daddy wasn’t helping him – ha! Before Nana and Papa left town, they wanted to grab some lunch with us. They stopped by, played with little man for a couple minutes, and then we headed out to Old Chicago. We headed home for naps, the hubs headed back to the cousins house, and we all just had a relaxing afternoon! The evening was capped off with a little dinner with a couple Oiselle ladies! We have a few local birds – soon to be 1 less (sad day!!) – and we don’t get together nearly enough! Dinner it is!! We caught up on race schedules, life events, and good eats! I am so glad to be a part of an awesome woman community of runners 🙂 Thank you Cathy for always trying to get us birds together to get to know one another better 🙂 I look forward to our next, hopefully bigger, meet up!! I headed home, got little man ready for bed, and put myself to bed soon after. The best way to start the day – with a run! Ashley and I left town for KC at the start of our usual workday – we are heading to the Decorated Apparel Expo (or DAX for short). This expo has a couple locations in the US and we are lucky that one stops so closet to home. This expo is a great way for us to get inspired and see what new art processes are in the market! New screen printing techniques, different ways to embroider, wood working, screen printing, new garments and materials, and exciting new ways of enhancing old processes. After the show, we went out to lunch, stopped by the Gear For Sports showroom, and headed home! Since the day was still nice, little man and I headed to the park! We stopped by the gym fora few minutes to see what their TGIF event was all about…but since it was going on all day, the fun had subsided and everyone was ready to go home – so we went home! Morning time = Run time. I decided that little man and I were going to go over to Aggieville and support a local business. The other morning, the business district of Aggieville was burned up 😦 The Dusty Bookshelf has been a great place to go and hang out, as well as find a good book! They were remodeling the store so a good portion of the books were not damaged. 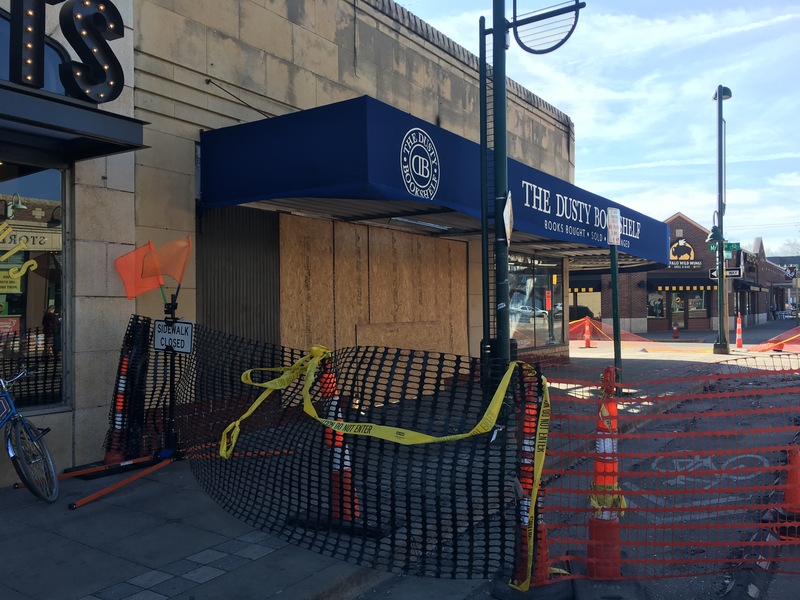 The surrounding stores had some smoke damage – including Varsity Donuts. Little man is a BIG fan of donuts – so I always let him pick them all out 🙂 This time, he picked a Fruity Pebbles donut to eat and a random assortment to take home. I tried the holes and coffee – everything is as great as ever (even though they had to completely clean out the store, down to the last sprinkle!). The next stop – little man’s choice, the pet store! Cats, dogs, hamsters, fish, mice, birds…he loves seeing everything! We headed home after a little while. Good thing too! We weren’t home 10-15 minutes before there was a ring at the door! Rich and his gang came by to remove the 3 hops plants from our garden. While the hubs is still brewing beer, the hops plants have become a bit too much for our little garden beds and Rich, who also brews beer, has quite a bit of property to let these plants grow! It was quite a task to get them all dug up! Once the guys left, it was nap time for little man…and relaxing time for momma (and one of the kitties). After a couple hours of restlessness upstairs and finally a little napping, little man was up and ready to party! Well…not party, but we had movie plans! We popped some popcorn, packed up a couple snacks, and headed to the KSU Student Union for the 7pm showing of SING! We had a good time! Once back home, it was time for bed for everyone! 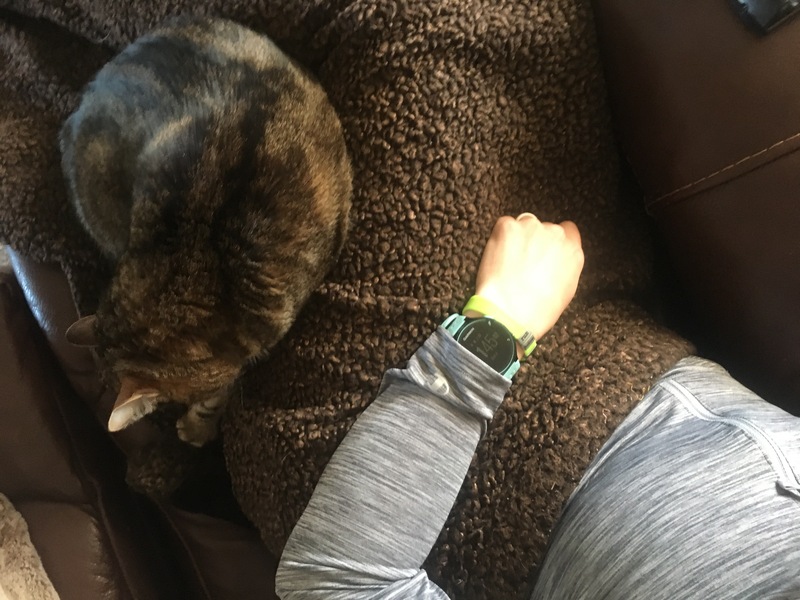 While my training plan didn’t really call for any running today, I wanted to get out and enjoy the nice weather – and since Angie wasn’t able to get out the day before, this was going to be her long run for the week! I like running. Running is my favorite. • I am pleasantly surprised that I didn't go crazy with a metronome ticking in my @myaftershokz for over 10 miles… I guess my surroundings were interesting enough that the ticking was just background noise. • On the plus side, my metronome was set to 172 – and my cadence ranged from 168-175, mostly in the upper 160s. Any improvement from the 165 range is great for me!! Whoop!! Since Angie and I started later than usual, little man was up and ready to get the day started when I got home. We made up some breakfast, broke out the playdough, painted some, and played cars across the livingroom. Before too long, I decided to head to the store with little man in tow. 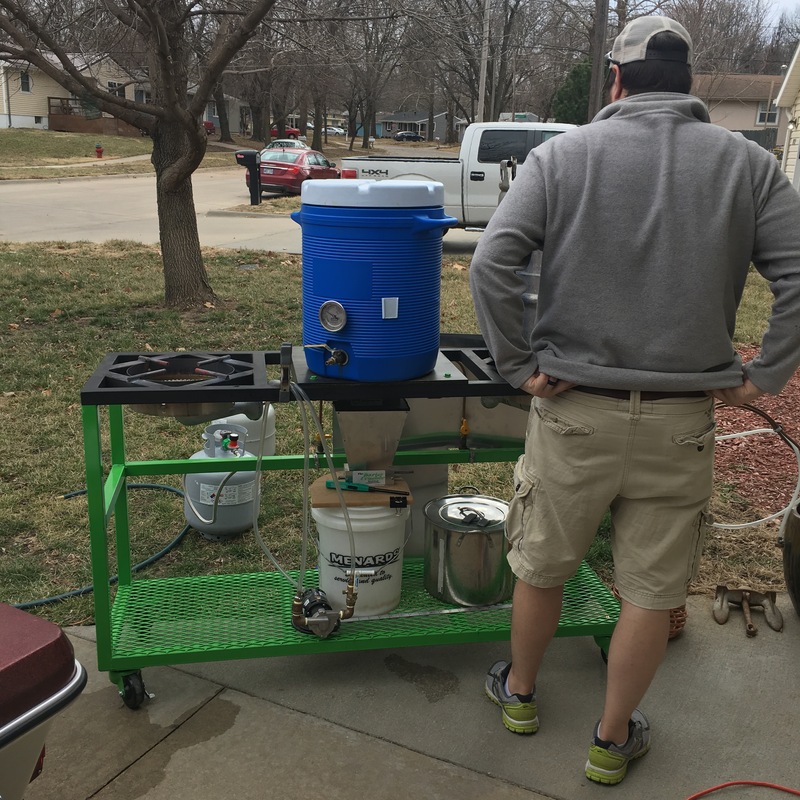 The hubs was planning on brewing today, or else I would have left little man at home. We were out for a little longer than I expected, but it was a good trip! When we got home, it was already time for little man to go down for a nap! Once he was down, I headed out to the garage to hang out with the hubs for a little bit. The weather started getting a little chilly, so I headed inside…about that time, little man was up from his nap. The hubs went out for a beer brewing class of sorts at a local brew shop – and I started making up an InstaPot recipe I found on FB earlier in the day. Since I had most of the ingredients, I decided to try it! Un-Stuffed Cabbage Bowls – I subbed ground venison for the beef, no rice, and added some sliced bell peppers 🙂 Super easy to make and tastes great! 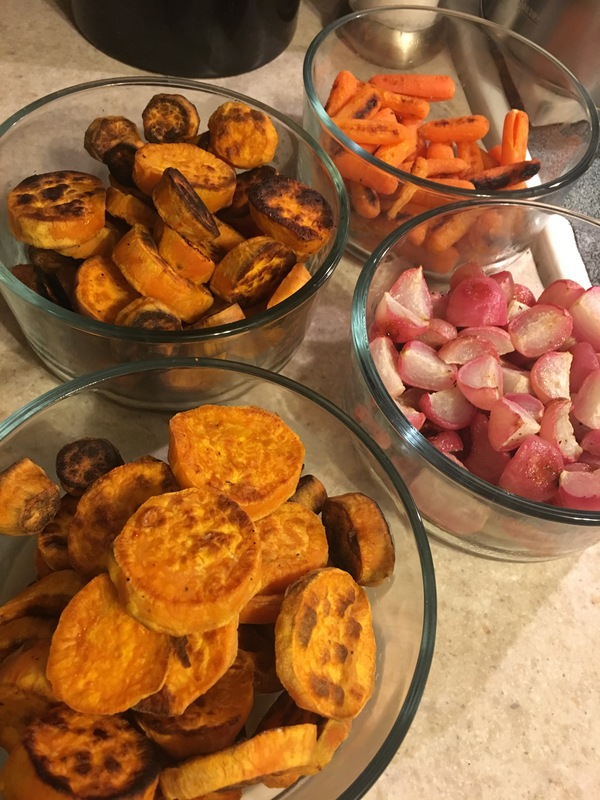 I also made up some roasted vegetables for the week – or as long as they last! Another handful of wonderful weekends in the books. That sunset picture is beautiful. Thanks! Once in a while, I am able to capture the sunrise – most days, I am already inside changing for the day. Birthdays are always fun. That cake looks delicious. I bet those donuts were just as tasty. I would make sure a long run was definitely on my to do list to have some of those afterwards.